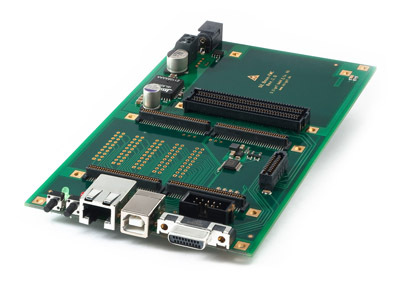 This base board is intended for evaluation and rapid prototyping with all D.Module2 DSP boards in conjunction with a D.Module2 FPGA peripheral board. All peripheral signals are available on connectors and headers. A LPC FMC site allows to connect industry standard FMC mezzanine boards, e.g. high-speed A/D and D/A converter boards,connectors and headers.